The stem is fleshy, smooth, branched, and purplish-red or green with reddish coloration. The leaves are thick, smooth and fleshy, and green to reddish in color. They have broad-rounded tips with smooth margins. The flowers are yellow, found solo at the leaf axils and clustered at the end of the branches. A single plant can produce as much as 10,000 seeds. 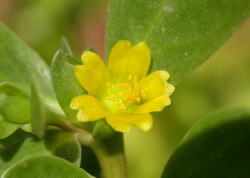 Common purslane serves as an alternate host for various plant diseases and nematodes. Its ability to produce plenty of seeds can result in the easy colonization of your farm. It forms a dense mat that prevents seedlings from germinating, and competes for soil moisture and nutrients. It can reduce yield from 20-40%, depending on the crops. It is used as vegetables and also for medicinal purposes. It is also used as hogs' feed. The seeds are made into flour and are a source of blue dye. Studies show that the weed is found to be resistant to Atrazine and Linuron in some carrot fields in Michigan, USA (Weeds Science, 2005). Proper soil tillage or thorough land preparation by plowing and harrowing at least two times. Crop rotation with sorghum. Sorghum has the ability to reduce the emergence or growth of pigweeds (Kebede, 2004, p.3). Mulching at least 3 inches thick prevent the seeds from germinating. Kebede, Z. (2004): Allelopathic chemicals: Their potential uses for weed control in agroecosystems. Department of Weed Biology and Weed Science. Fort Collins, Colorado.